The shopkeeper is ready now…. He quickly pulls a hammer and hitz the parrot on the face. The local bar was so sure that its bartender was the strongest man around that they offered a Rs 10,000 bet. The bartender would squeeze a lemon until all the juice ran into a glass, and hand the lemon to a patron. Anyone who could squeeze one more drop of juice out would win the money. Many people like weight-lifters, wrestlers, body builders, etc had tried over time, but nobody could do it. One day this scrawny little man came in, wearing thick glasses and a safari suit, and said in a tiny, squeaky voice, “I’d like to try the bet.” After the laughter had died down, the bartender said OK, grabbed a lemon, and squeezed away. Then he handed the wrinkled remains of the rind to the little man. But the crowd’s laughter turned to total silence as the man clenched his fist around the lemon and 5-6 drops fell into the glass. As the crowd cheered, the bartender paid the Rs 10,000, and asked the little man, “What do you do for a living? We all love receiving scraps, but constantly checking back to your scrapbook page can be tedious. How many of us have our scrapbook page open and are clicking refresh on it constantly! 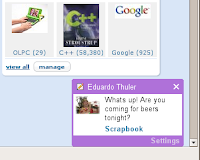 With scrap notices you can be on any orkut page and find out that you have received a scrap – that very minute. You could be browsing your friend’s photos, and find out “hey! I just got a new scrap.” Then you can click on the “Scrapbook” link to reply on the spot. This way you’ll be free to explore all of orkut, comforted in the knowledge that when you have received a new scrap, you’ll know about it that moment. We’ll be rolling this feature out over the new few days for all users, but If you really prefer clicking the refresh button all day long, you can go to settings to disable to the feature.